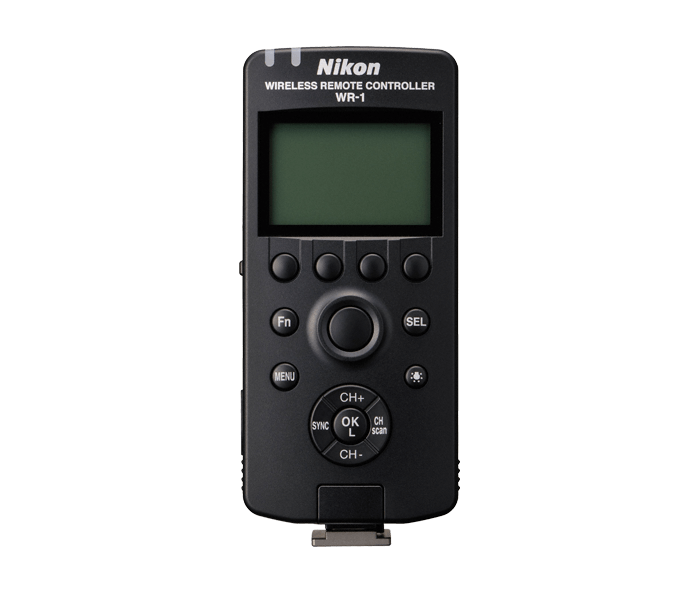 The WR-1 Wireless Remote Controller is part of the Nikon Wireless Remote Control system, which uses radio frequencies to communicate instead of infrared signal which requires direct line of sight, extending the capabilities and reach possible when photographers need the ability to control cameras remotely. The WR-1 Wireless Remote Controller can act as either a transmitter or receiver unit; and is compatible with the WR-T10 transmitters and WR-R10 transceivers. The WR-1 is compatible with the WR-T10 & R10 as long as the WR-1 is set to Group A, as the WR-R10/WR-T10 system is fixed on Group A. Photographers can use the WR-1 to simultaneously release the shutter on multiple Nikon cameras that have a WR-R10 and/or WR-1 units attached and have been paired with it. Likewise, the WR-1 can be used as a transceiver, to be controlled by a WR-T10 that is paired with it. The WR-1 is compatible with the WR-T10 & R10 as long as the WR-1 is set to Group A as the WR-R10/WR-T10 system is fixed on Group A. Up to 20 WR-1 units can be used at one time (including 3 transmitters). The WR-1 has access to 15 radio frequency channels (1-15), to prevent interference when multiple pairings or photographers are shooting in one location. Using the WR-1 display, you can even visualize the traffic in each of the 15 channels and select the one with the least amount of traffic to minimize interference. The WR-1 also can access up to four groups (A, B, C, D), to further separate out groups of cameras that need to be controlled independently and simultaneously. The WR-1 can be designated as a “master” and control the shutters of up to 20 WR-1 units, or 64 WR-R10 units. The WR-1 is compatible with the WR-T10 & R10 as long as the WR-1 is set to Group A as the WR-R10/WR-T10 system is fixed on Group A. Useful for triggering the shutter remotely when using slower shutter speeds (up to 60 minutes) for long exposure photography, to prevent camera movement as well as when shooting interval timer photography. When using the release delay mode on the WR-1 transceiver, different delays can be used for different receivers, allowing the shutter release to be staggered over a series of cameras using a single transmitter. Range (line of sight) from a WR-1 to another WR-1 is approx. 394 ft. When using a WR-1 as a transmitter and another as a transceiver, a third WR-1 unit can be used as a relay unit to effectively double the distance (line of sight) to the same 394 ft between units. When connected to a camera as a transceiver, the WR-1 must be connected to the DSLR using either an MC-37 or MC-38 cable. When connected to a D4, D4S, D810, D800/D800E, D750, D610, D600, D5500, D5300, D5200, D7200 or D7100 DSLR, the Fn button on the WR-1 has full control of the features that the camera’s Fn button controls. When connected to a D7100 DSLR, the photographer can view and change camera settings remotely on the camera using the LCD information display on the WR-1. Comes with a printed manual, drawstring bag, MC-37 Connecting Cord (for ten-pin remote terminals) and MC-38 Connecting Cord (for accessory terminals). Find out more about the WR-R10/WR-T10/WR-A10 set. Find out more about the WR-R10. Find out more about the WR-T10. Find out more about the WR-A10. Watch this tutorial video on setting up and using the WR-1 Wireless Remote Controller.